Select a question to see its answer. If you don’t see the answers you’re looking for, please contact us. Our industry experts will be glad to talk with you. Is it necessary to place the unit on a concrete or asphalt pad? It is not necessary to place your portable building on a concrete or asphalt pad, but these pads do enhance the leveling of the building. At a minimum we recommend a compacted crushed stone base beneath the building. Should you choose to go with concrete we recommend a 6 in. – 8 in. pad. Check local building guidelines to determine if a footer is required and, if so, how deep the footer is to be. How much maintenance should I expect to encounter over the life of the building? Your portable vault is very low maintenance. You will need to grease the door hinges regularly (2-3 times per year in mild environments and monthly in more extreme environments). A grease fitting is attached to the hinge making it easy to apply the grease deep into the hinge. The paint should last 8-10 years in mild conditions. However, in extreme environments such as coastal areas the life will be less. The best practice is to thoroughly inspect the exterior finish 2-3 times per year. Early detection of a problem will greatly limit the amount of maintenance needed to remedy the situation. Contact Armag Corporation (800-443-9994) with any questions. For buildings that come with electrical components, what do I need to hook up the power to the unit? If your unit has electrical items installed by Armag Corporation it will come with an external electrical disconnect panel installed. A licensed electrician should be contracted to bring power to your building. The power will be connected to our exterior mounted disconnect. I don't see a building on your website that meets my unique needs. Do you offer customization? 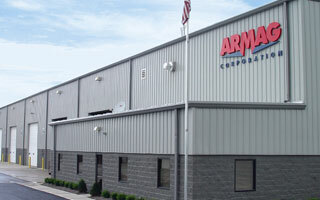 Yes, Armag Corporation can customize the building to meet your needs. We understand the ATF and military safety regulations and will make recommendations that will keep your project in compliance. There are a variety of standard options that we offer and we are happy to discuss options unique to your needs. Contact us to discuss your application. How is the building delivered and offloaded? Freight to your site and offloading charges are the customer’s responsibility. We arrange the transportation for you and will add it to your invoice. Offloading equipment for your unit will be determined by the size of the unit. Small units may be offloaded with a forklift while large units may require the services of a crane. Your Armag sales rep can help you determine which type equipment may be needed. If a crane is required we recommend you contact a local rigging company and have them do a site survey before the load is shipped. The distance in which the crane will have to swing the load will have a significant bearing on the size crane needed. Also, during the site survey the rigger will look for overhead obstructions (trees, power lines, etc). One should also know that trucks may be 75′ – 100′ long so you need to evaluate the roadway to determine whether there are tight turns in the road that the truck may not be able to navigate. Is it necessary to ground the building? Yes, to protect your building against electrical strikes it will need to be properly grounded. A licensed electrician should be used to connect the ground brackets, cables, and rods (sold separately) to the building.